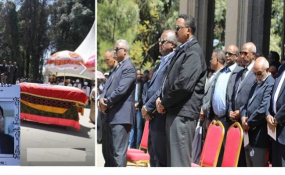 The funeral procession for former Speaker of the House of Peoples’ Representatives (HPR), Dawit Yohannes held at the Holy Trinity Cathedral Church. Addis Ababa — The funeral procession for former Speaker of the House of Peoples' Representatives (HPR), Dawit Yohannes held at the Holy Trinity Cathedral Church today. The funeral service was attended by Deputy Prime Minister, Demeke Mekonnen including several senior officials. Speaker of the House Tagesse Chafo, and other members of the House, federal and regional senior officials and former colleagues has laid a wreath of flowers. The late ambassador and former speaker, Dawit Yohannes, has played a significant role in strengthening and establishing modern parliament democratic system in Ethiopia. Dawit had served as the first speaker of the house from 1995 to 2005 after the ratification of Ethiopian constitution and Permanent Representative of Ethiopia to the United Nations. It was learned that he was married and a father of three children.